By 1958, almost one thousand trolleys and thirty-five trolley routes had been scrapped, replaced by a fleet of as many new General Motors diesel buses (National City Lines was organized by General Motors, Firestone Tire, Standard Oil and Phillips Petroleum). The remaining fleet of about 500 PCC trolleys served the fourteen surviving routes, including the five lines that utilized the city's new extension to the Subway-Surface tunnel. For ten years after the 1950s bustitutions, the heavily pruned trolley network survived without further vandalism. However, within a year of new public transit authority SEPTA's acquisition of the PTC, trolley Route 47 was abandoned and replaced with diesel buses. Another ten years would pass before the next SEPTA bus substitution, this time the Route 60 on Allegheny Avenue. Both had operated from Luzerne Depot in the Hunting Park section of the city. In 1981, a fleet of 112 new SEPTA-designed, Kawasaki-built LRVs arrived for service on the five routes that operate through the Subway-Surface tunnel and the streets of Southwest Philadelphia. At that time, the new Elmwood Depot was completed and a new trolley maintenance shop replaced the Civil War-vintage Woodland Carbarn. The future of the Southwest Philadelphia Subway-Surface trolley network seemed secure. *PCC 2715 was the pilot GOH car, and was not included in the total count. PCCs completed through 1984 were rebuilt at Courtland Shops. PCCs completed starting in 1985 were rebuilt at Woodland Shop. Despite this large fleet of renewed PCCs, SEPTA management seemed to give up on the North Philadelphia trolley network. The Route 50 saw its last streetcar in 1980. By 1986, the Routes 6 and 53 were dropped. In 1992, only the routes 15, 23, and 56 remained, and in August of that year, the city administration dropped its opposition to SEPTA's plan to "temporarily" operate these last three routes with diesel buses. As part of the deal with the City, SEPTA promised to purchase new light rail vehicles for those lines, with a target date of 1997. Instead, four hundred diesel buses were purchased, and Luzerne Depot slated for demolition. The fleet of recently overhauled PCCs was dispersed across the country. Some were scrapped by SEPTA, others purchased by museums, and some bought by cities that still see some value in the cars, notably, San Francisco's Municipal Railway. Route 51 was a short-lived effort to operate a tourist-oriented streetcar line from Center City to Philadelphia Zoo. Three refurbished PCC cars ran on dormant sections of Route 23 and Route 15 tracks. Poor publicity resulted in few riders. Route 51 operated sporadically during 1995 and 1996. In September 1997, faced with the City's threat to withhold its share of funding for SEPTA, the transit authority made good on its promise to restore trolleys to Route 15 Girard Avenue. After bids for a small fleet of new low-floor LRVs came in at around a staggering $3 million per car, it was decided that the mothballed fleet of postwar PCCs might be rebuilt instead. Near the beginning of the Route 15 trolley restoration project, anti-trolley managers were promoted within SEPTA, and tried to kill the trolley project. SEPTA management's effort to scuttle the Girard Avenue project ultimately failed, but the anti-trolley managers continued to sabotage the Route 15 project whenever possible. Instead of 26 rebuilt trolleys, only 18 were ordered. Eighteen is not enough trolleys for Route 15, so service is often provided by a mix of trolleys and diesel buses. Even though it would have been relatively inexpensive to do so, the eighteen rebuilt streamlined trolleys were deliberately not fitted with electronic signal gear that would have enabled their use in the Center City trolley subway. Therefore the rebuilt streamliners are restricted to Girard Avenue, and occasional special charter service. Thus has the anti-trolley management within SEPTA succeeded in marginalizing what any other city would see as a tremendous asset and source of civic pride. These colors coincide with the legend used on the Philadelphia Trolley Map. Route 6 was a remnant of the suburban line that once ran to Willow Grove. 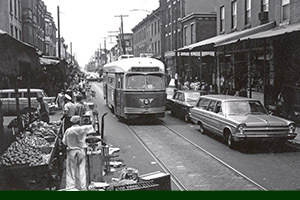 After the June 1958 cut-back, Route 6 ran between Cheltenham Shopping Center and Olney terminal, running along wide Ogontz Avenue. Despite objections from the City, the SEPTA board voted to convert Route 6 to a diesel bus line. The last day for streetcar service was January 11, 1986. That SEPTA would convert this viable streetcar line to diesel buses indicated how bleak the future was for the North Philadelphia trolley network. Route 10 runs from West Overbrook to University City, and then through the Subway-Surface tunnel, looping at Juniper St. under city hall. A new depot, heavy maintenance shop, and 112 new LRVs were furnished for the five Subway-Surface lines in the early 1980's, insuring their survival. Subway-Surface Route 11 streetcars run beneath Center City, then on Woodland Avenue to Darby Borough in Delaware County. Pre-war "air cars" such as 1940 PCC 2562 mixed with postwar PCCs until the Kawasaki LRVs replaced them. Route 13, the Chester Avenue line, was re-routed through the Subway-Surface tunnel when the extension opened in 1956. PCC 2050, delivered to Philadelphia in February 1941, leaves the subway portal for street running at 40th Street. The "superblock" dormitories of the University of Pennsylvania campus loom in the background. Operating out of West Philadelphia's Callowhill Depot, Route 15 runs from the West Philadelphia neighborhood of Haddington, across North Philadelphia on Girard Avenue, then on Richmond Street to Port Richmond. One of three routes made "temporary bus" in September 1992, political pressure in the late 1990s forced SEPTA to plan for restoration of trolley service on one of the routes: the 15. Trolley service was finally restored in 2005. Route 23, Philadelphia's (and the world's) longest streetcar route, was one of three "suspended" by the SEPTA board in 1992. Running from South Phila, through Center City on 11th and 12th Streets, the 23 continues north on Germantown Avenue through North Philly to Chestnut Hill. Despite millions invested by the city and state governments to replace rails and overhead wires in Mt Airy and Germantown, SEPTA managment has no interest in restoring streetcar service. Route 34, the shortest of the West Phila Subway-Surface lines, runs from the Delaware County line at Cobbs Creek, along Baltimore Avenue en route to Center City. As the line approaches the subway portal at 40th Street, it passes through the newly designated "Streetcar Suburb" historic district, west of University City. Penn now offers a $15,000 grant to university employees who purchase homes in this area. Route 36 begins at the Penrose Plaza shopping center, near Philadelphia Int' Airport, and uses the reserved median of Island Avenue for about one mile before running as a streetcar on Elmwood Avenue. The Island Road trackage once served the giant Hog Island Shipyard during World War 1, and later, the Chester Short Line. Access to Center City is via the 40th Street portal to the Subway-Surface tunnel. 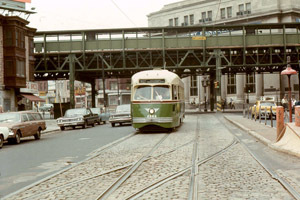 After its aquisition of Philadelphia Transportation Company in 1968, it took less than a year for SEPTA to kill the first of many electric trolley lines it had inherited from predecessor PTC. Beginning in deep South Philadelphia at Wolf Street, Route 47 occupied 8th and 9th Streets through South Philly, Center City, and North Philly, and 5th Street through Olney as far as Godfrey Avenue. For a more detailed article about Route 47's last days, follow this link. 1948 PCC 2117 threads its way through the Itallian Market on South 9th Street in June 1967. Trolleys are long gone but the Italian Market, a Philadelphia "institution," continues to this day. Route 50 ran from the northeast Phila neighborhood of Lawndale, down Rising Sun Avenue and 4th and 5th Streets to far South Phila. This line saw the use of the Blackpool England "Boat Car" trolley during the Bicentennial of the Declaration of Independence in 1976. Trolleys stopped running in 1980, and despite denials by SEPTA management, crews ripped up track on 5th near Girard Avenue in 1983. The SEPTA board sealed the line's fate in 1985. "In a meeting marked by debate and public criticism, the SEPTA board yesterday reluctantly voted to close two Philadelphia trolley car lines so they could be converted to bus operations. 'I abhor this vote,' said Judith E. Harris, one of Philadelphia's two representatives on the 11-member board. Harris said board members should be more concerned with improving public transit than destroying it." Still the trolley-to-bus conversions continued. Route 53 connected fashionable West Mount Airy on Wayne Avenue, to North Philadelphia, with the east end of the line looping on the grounds of Luzerne Depot. In 1938, the first fleet of twenty PCCs were placed in service on this line. SEPTA abruptly tore down overhead wires on the Route 53 in 1989, four years after classifying the line "temporary bus". 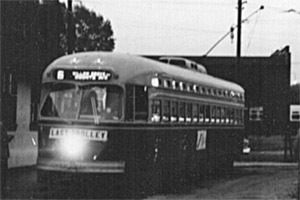 When this streetcar entered service in 1948, the PTC scheduled sixty-four trolleys to handle the thousands of riders who lived and worked along Route 56. By the end of service in 1992, only about 18 cars were needed for the line, which runs from Nicetown, along Erie Avenue and Torresdale Avenue to Tacony. Although SEPTA promised, in 1992, to buy new LRVs for this line, current managment has no intention of doing so. PennDOT has been allowed to pave over rails in some places, and SEPTA went to great expense to cut down steel overhead line poles along Torresdale Avenue. Route 60 used wide Allegheny Avenue in North Philadelphia, connecting East Falls with Port Richmond and the Route 15 trolley. Without public hearings, SEPTA replaced streetcars with diesel buses in 1977. In 1983 a City Water Department crew tore out 700 feet of trolley track between Amber Street and Frankford Avenue. A Daily News article at the time quoted an official as saying "We were told the rails were deteriorated, and trolley cars wouldn't be using Allegheny Avenue any more." PRT estabished a new trolley line through Yeadon and Darby Boroughs (in Delaware County just outside the city limits) in 1918. Only a mile in length, Route 62 served as a shuttle linking the suburban terminal loops of two major car lines (Routes 11 and 13). In later years, Route 62 service was provided by one of two air-electric PCC cars, each of which was required to carry a certificate proving its owner (PRT and later PTC) had paid a nominal fee for permission to operate in Yeadon Borough. Route 62 ceased running as a separate line in 1971, becoming a weekday rush hour-only extension of the Route 13 trolley. 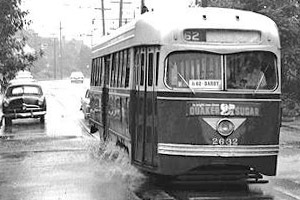 1942 PCC 2632 splashes through high water on Chester Avenue in Yeadon Borough.